I came across a recipe for pear upside down cake in Bon Apetit in 2011. It looked amazing. I remembered how much I actually liked my mother’s pineapple upside down cake, in spite of not really liking pineapples. And the cake was one of the moistest cakes I had ever had. So I was willing to give this a shot after making some modifications to “paleo-ize” the recipe (is that even a word?). This cake is rich, dense, moist, buttery and just delicious. I also tried it with apples but was not as impressed. Pineapple, plums, kiwi and strawberries would be a nice alternative to the fruit (pear) used in this recipe. Preheat the oven to 350 degrees F. Butter and flour an 8″ diameter cake pan and then line the bottom of the cake pan with parchment paper. 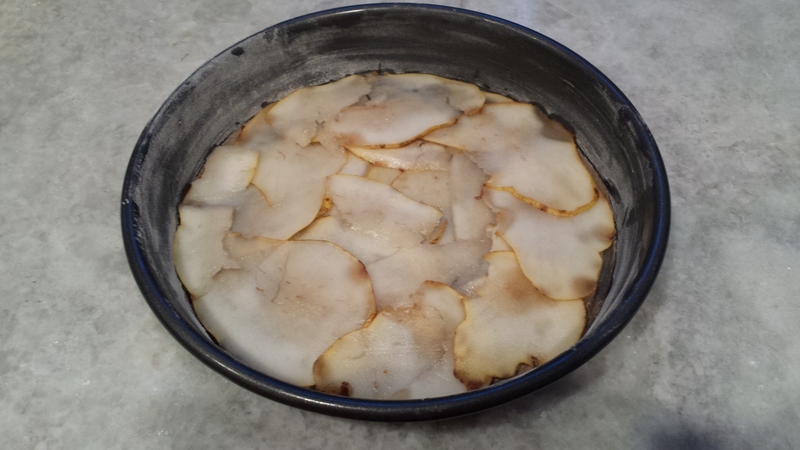 Think grade school – trace the bottom of the cake pan onto the parchment paper and cut out. 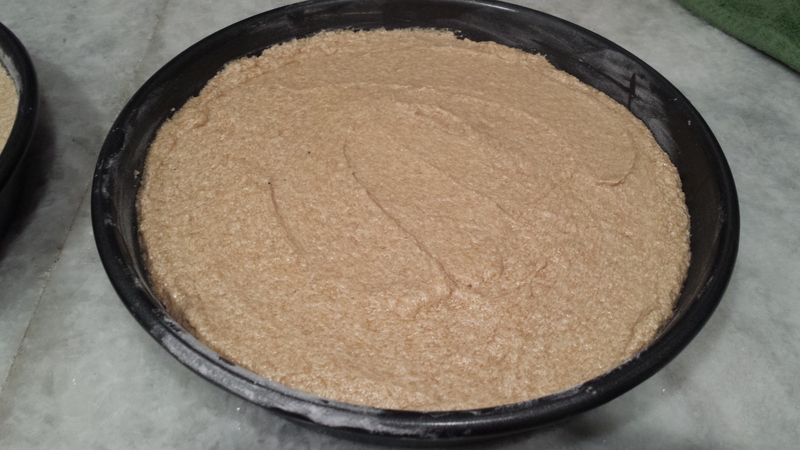 Combine the flours, salt, and baking powder in a small bowl and set aside. 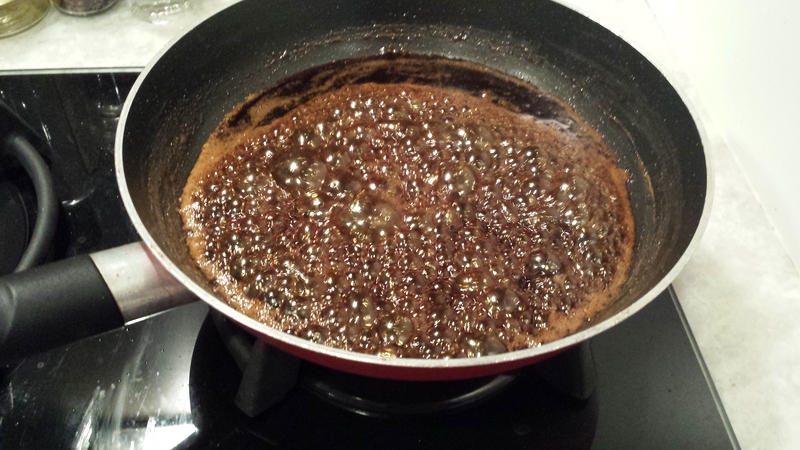 In a small saucepan, combine 1/4 c. palm sugar (4 T.) and 2 T. water. Add a pinch of salt, a pinch of nutmeg, and a pinch of ginger. Heat on medium-low heat until the sugar dissolves. 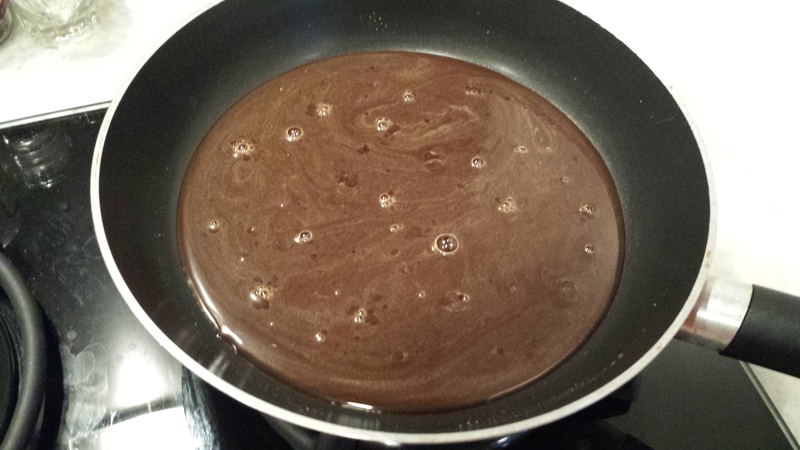 Increase the heat to medium-high and boil the syrup, stirring occasionally. 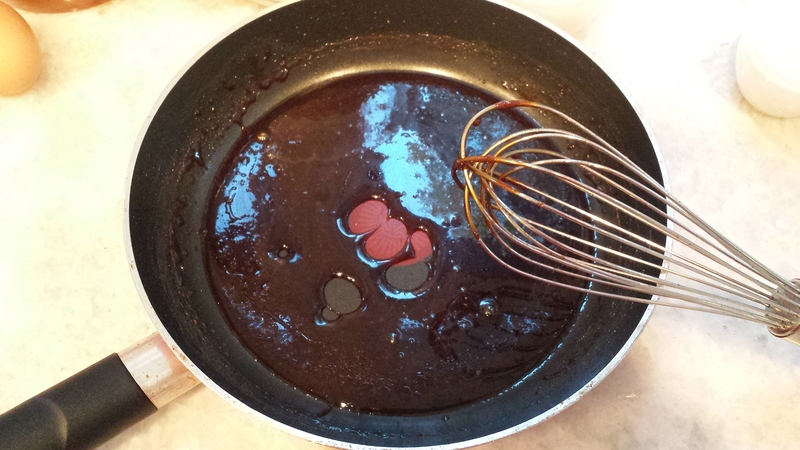 After about 8 minutes, the syrup will turn dark amber and thicken. Remove from the heat and add 1 T. ghee. 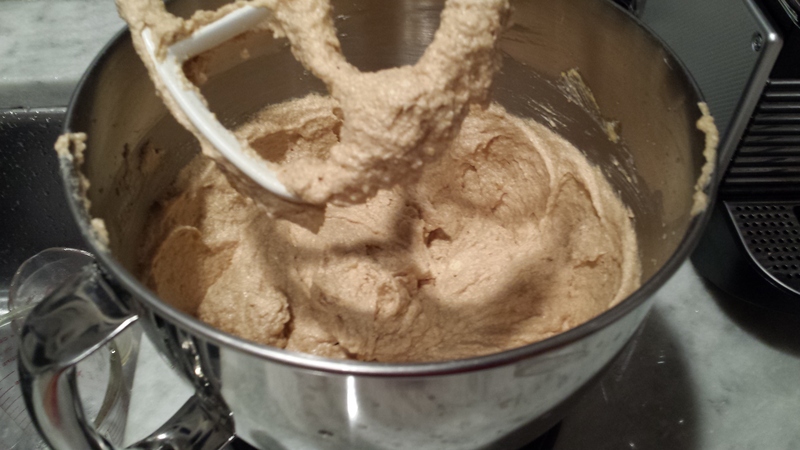 Whisk vigorously until the caramel is smooth; this takes some work, ghee doesn’t mix as well as butter. 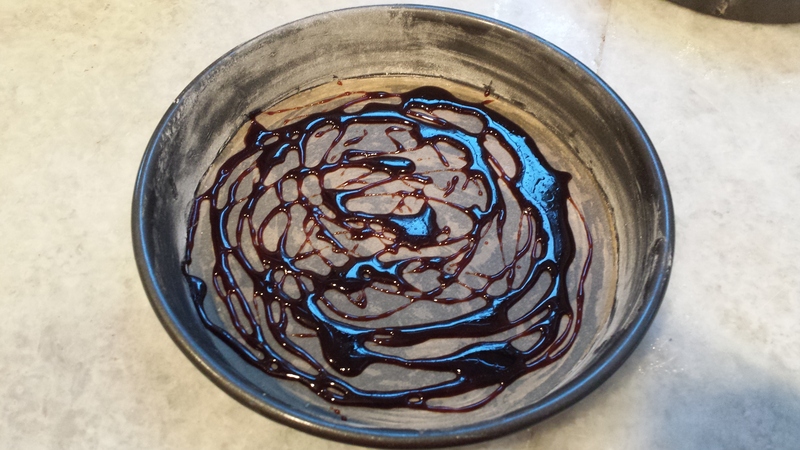 Pour, rather drizzle, the caramel sauce into the bottom of the cake pan. Now, using a mandolin, slice the pear lengthwise. The slices need to be thick enough to handle the slices without them breaking. 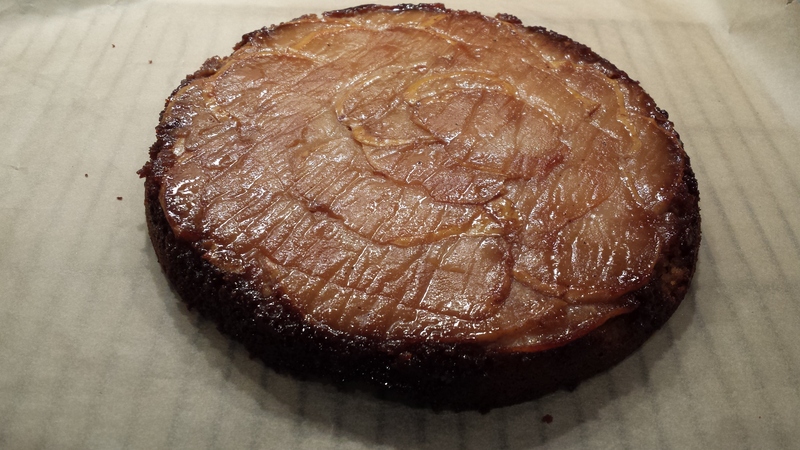 I preferred to leave the skin on – it leaves a nice outline on the slices and it does not compromise texture. Layer the slices over the caramel, overlapping them as needed. 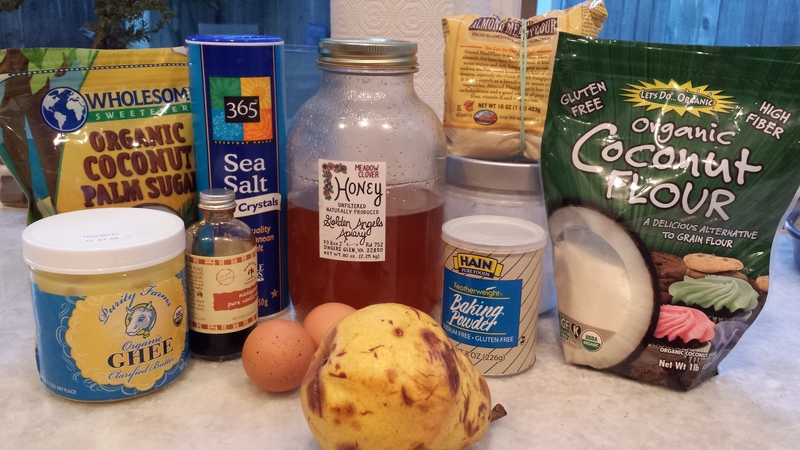 Mix the remaining palm sugar, honey, vanilla, ghee and coconut oil in a large mixing bowl. Beat until light and fluffy. Add the yolks, one at a time – make sure you scrape the sides of the bowl occasionally. Beat in the flour mixture in 3 additions, alternating with the milk in 2 additions – begin and end with the flour mixture. 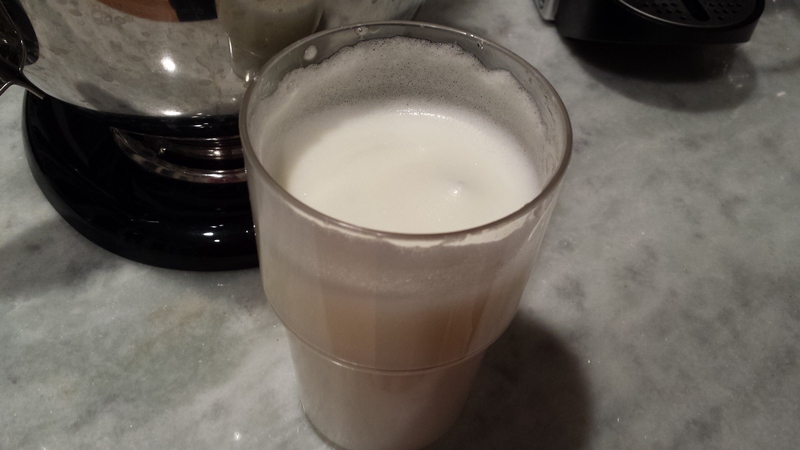 In a separate bowl (I use a high cup), whisk the egg whites until they form soft peaks. Fold the egg whites into the batter gently, to blend. Add the batter to the cake pans. 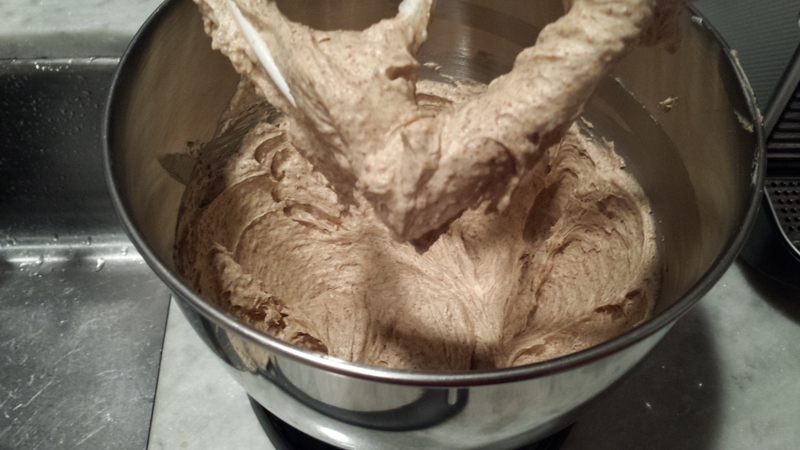 It is a really thick batter, so it won’t just pour or spread into the cake pan. You’ll need to smooth out the top with a spatula. Bake the cake for approximately 45 minutes. 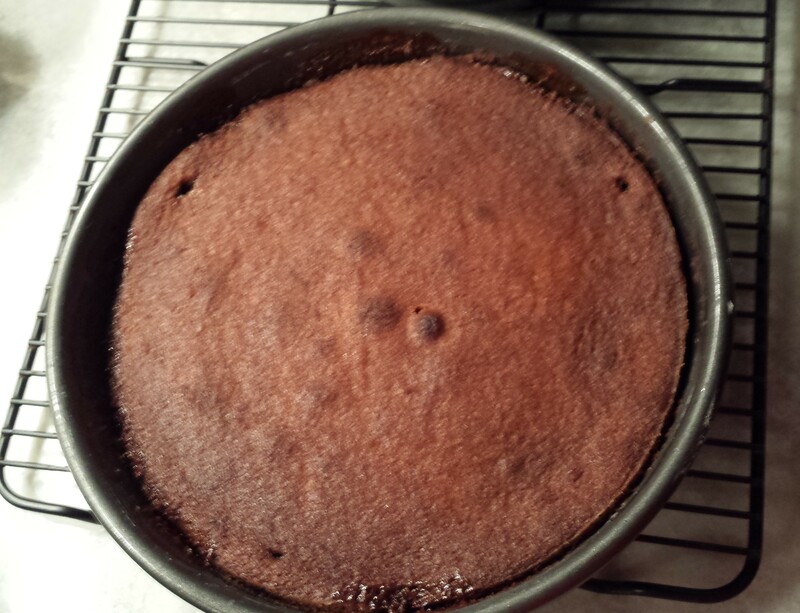 Rotate, the cake about halfway through. The top should be a nice golden brown. When you insert a toothpick into the center of the cake it will come out clean if the cake is fully baked. Let the cake cool on a wire rack for 30 minutes – this step is critical so don’t short cut it. Run a thin knife around the edge of the cake pan. 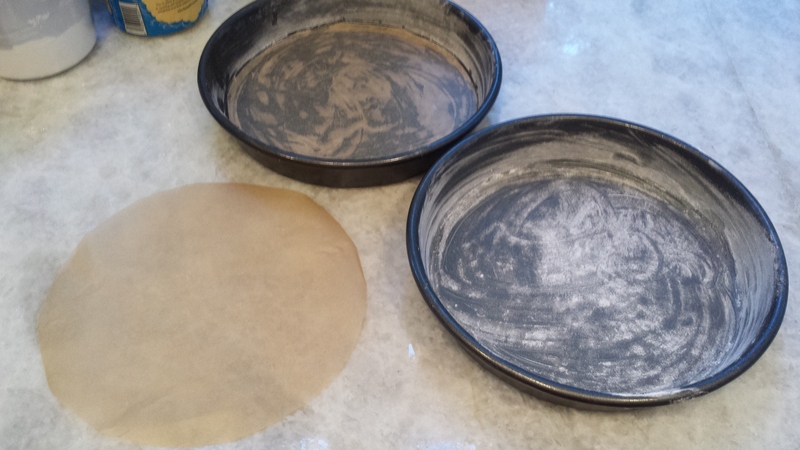 Place a piece of wax paper or parchment paper over the cake and flip over onto the cooling rack. Serve the cake warm or at room temperature. You can double your caramel and drizzle some over top of the slices once the cake is ready to serve, but this cake is so rich, it stands well on its own. I loved how the caramel sauce bubbled up the side of the cake and created these crunchy caramel spots along the ridge of the cake. Yum! 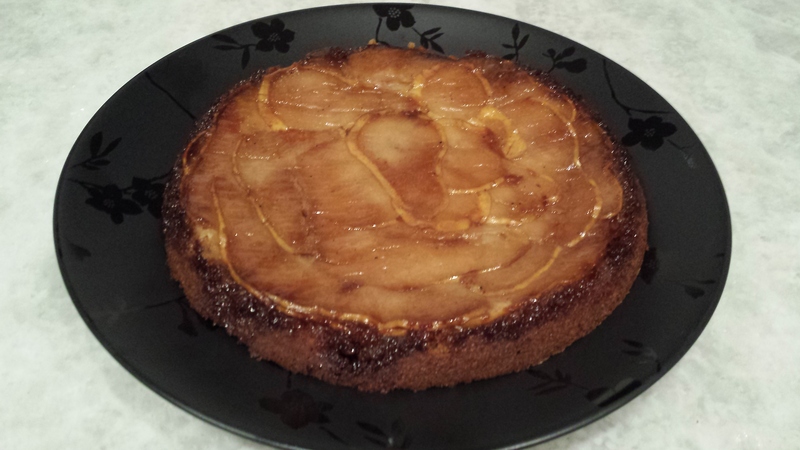 This entry was posted in baked good, dessert and tagged caramel, pear, upside down cake. Bookmark the permalink.